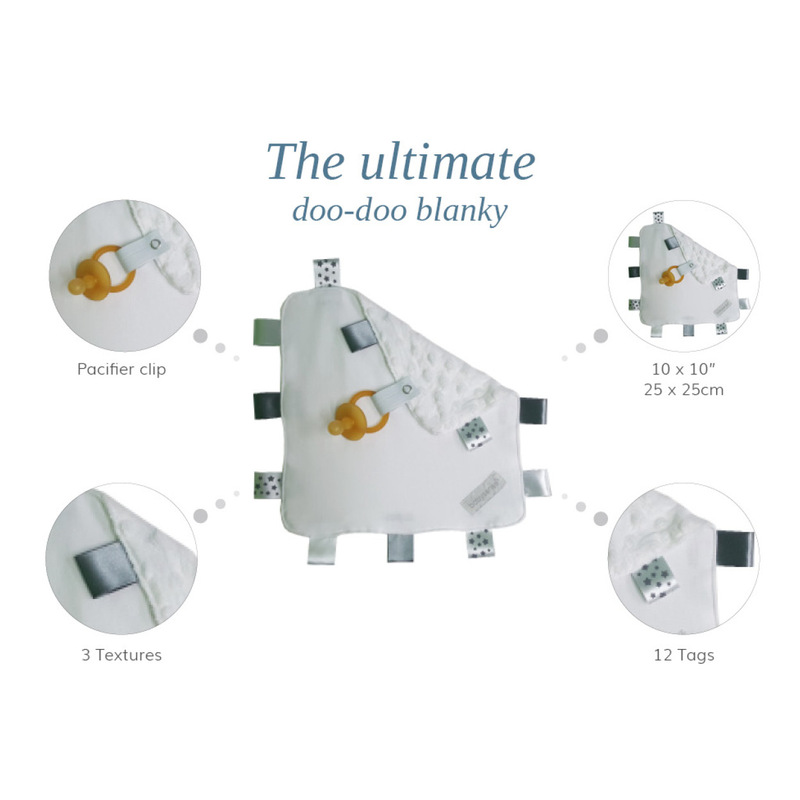 The Baby Sense Taglet Security Blanket is the ultimate ‘doodoo blanky’ (also referred to as comfort object or security blanket). 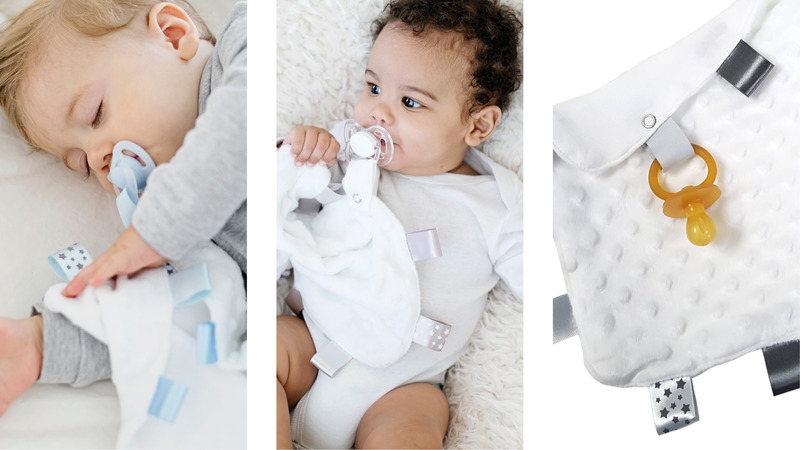 It’s made from incredibly soft textures, and brings soothing comfort at bedtime and beyond to newborns and toddlers alike. 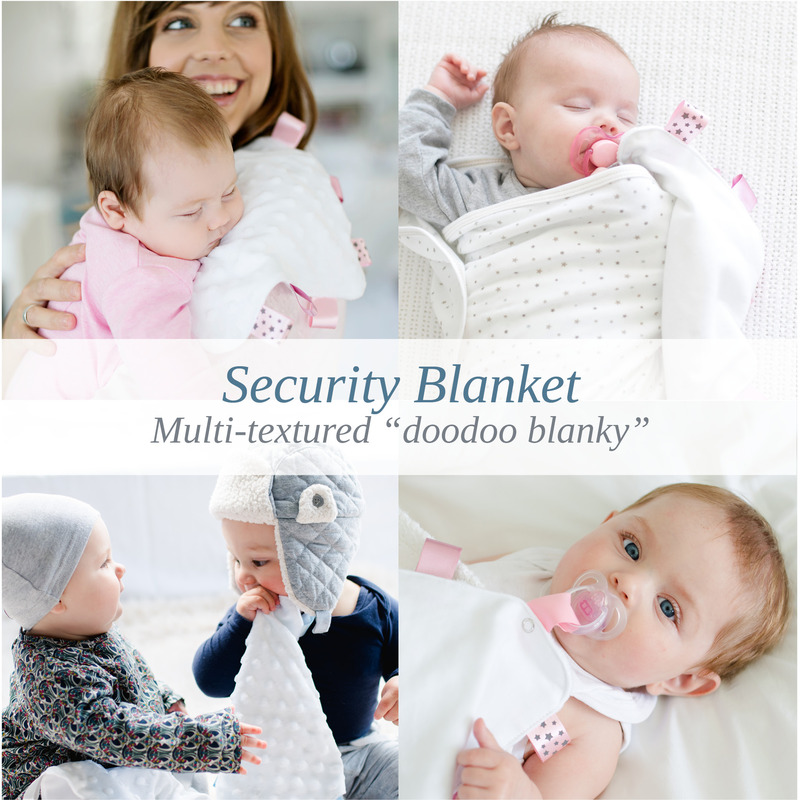 The Baby Sense Taglet Security Blanket is the ultimate ‘doodoo blanky’ (also referred to as comfort object or security blanket). 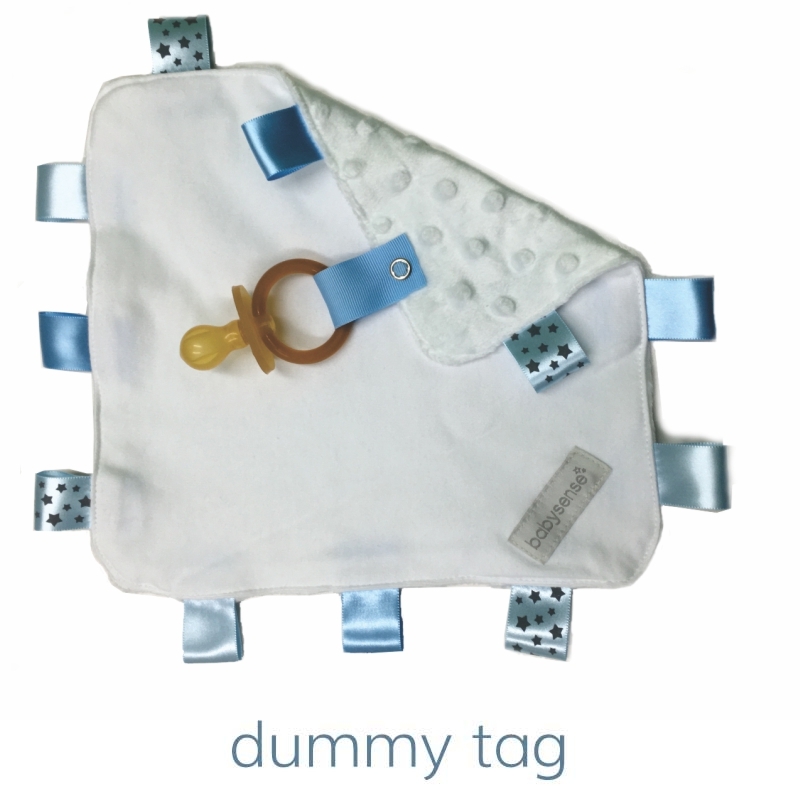 The soft chenille and smooth satin tags provide just the right soothing touch experience for your baby. When falling asleep your baby will rub the Taglet Security Blanket between their fingers or on their face. These are self-soothing strategies that your baby can use independently at night. This means a good night’s sleep for everyone! The optional pacifier tag puts a twist on security blankets, ensuring your baby’s pacifier is readily available when needed. As your baby gets older, you will notice some major developmental changes that usually happen between six and eight months, including crawling, the (potential) transition from three naps down to two, as well as an increase in your baby’s separation anxiety. That’s a lot of changes! Transitional objects often referred to as a comfort object or security blanket is one way that parents can help baby feel safe and secure. When can a baby self-sooth? This skill emerges from four months of age when the primitive reflexes begin to integrate and little ones can derive pleasure and soothing from their own techniques of calming. There is no shortage of research on sleep and many a researcher is searching for that holy grail of parenting – the promise of a full night’s sleep. In research released in late 2010, it was found that while most babies wake at night to feed and be settled in the early days, they rapidly begin to sleep for longer stretches until 4 months of age. However, the biggest predictor of a full night sleep is how well and at what age a baby begins to self-sooth. Pediatrics 2010; 126; e1081-7. So to ensure your baby sleeps through as soon as developmentally appropriate, encourage self-soothing. Why is a doo doo blanky or security item vital to development? Young children often benefit from a transitional object (often referred to as comfort object or security blanket) to help them cope when mom gradually separates for longer periods of time. The American Academy of Paediatrics says, “Your child may not choose a blanket. He may prefer a soft toy or even the satin trim on Mom’s bathrobe. Chances are, he’ll make his choice between 8 to 12 months of age and keep it for years to come. When he’s tired, it will help him get to sleep. When he’s separated from you, it will reassure him. When he’s frightened or upset, it will comfort him. When he’s in a strange place, it will help him feel at home. These special comforts are called transitional objects, because they help children make the emotional transition from dependence to independence. They work, in part, because they feel good: they’re soft, cuddly, and nice to touch.” – Healthychildren.org from the American Academy of Paediatrics. This secure bond is a positive sleep association that can help your baby during their partial awakenings. Because the transitional object does not change, it is soothing. Essentially, the object is meeting baby’s need for love and attention even when mom or dad is not actually there. When should a transitional object be taken away? Sometime between the ages two and five, most kids are ready to say good bye to their security objects, however they may occasionally cling to these during times of stress. Dr. George Askew of Zero to Three points out that a transitional object is often an indicator of a strong parent-child bond. Essentially, the object is meeting baby’s need for love and attention even when mom or dad is not actually there, but do keep an eye out if your little one is always snuggling his Taglet Security Blanket instead of playing with toys or interacting with his peers. If so, try to understand what the underlying cause is such as absenteeism of one of the parents, etc. 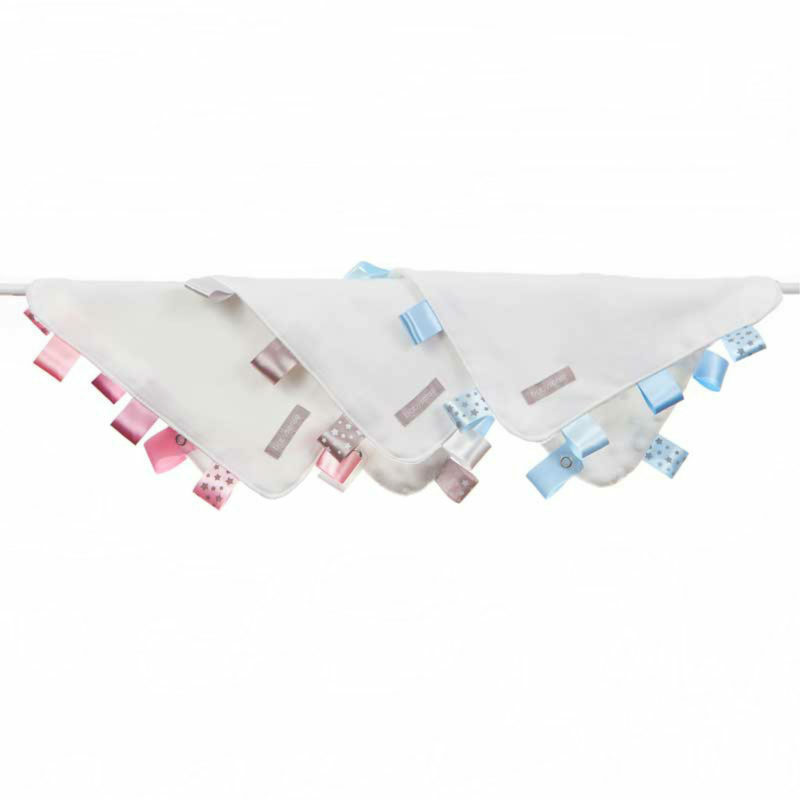 Place your Taglet Security Blanket in your baby’s hands when he is settling to sleep for babies older than 4 months. Babies are smart, and once they’ve become attached to a Taglet Security Blanket, they will notice subtle differences in texture, look, and smell. You can attempt to stave off the eventual loss or disintegration by switching back and forth between two regularly. The hope is that your baby won’t notice the difference, and by the time it matters, both will be in the same state of ‘loved’. Since babies are very sensitive to changes in smell and texture, if you start off by washing the Taglet Security Blanket on a regular basis, your baby may become accustomed to having it washed, making it less of a fight for you in the long run. Failure to follow each of the following warnings and instructions can result in serious injury or death. This item contains small parts and can cause choking. Inspect before each use and throw away if any part of the pacifier clip is worn, damaged or not securely attached. Test that the security blanket’s ribbons are secure at all times by pulling each ribbon with moderate force. If you are able to dislodge the ribbon, discontinue use and replace. Do not allow security blanket to cover infant’s face or restrict air flow. Let security blanket cool after leaving in sun, hot car or hot room. Seek advice from a health care professional if uncertain. Read instructions for additional warnings and recommended guidelines. Keep packaging for future reference.